If the house was foreclosed… why? Was it the layout? Was it not priced correctly? Was it listed previously? If it was listed, compare the old and current listings to see if you can see any discrepancies. 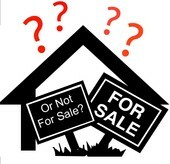 We have another blog article named “Looking to Sell? Here’s the Top 5 Reasons Why It May Not”. Read this article to see why this house didn’t sell. It could have been the location, functionality or condition. Whatever it was… you want to try to figure it out before you make an offer, not after you move in. If you need to sell the home later, you want to be able to without surprises. The more you do now, the better off you will be!